Good-looking and good for you. Photo courtesy of Botanica. We think of the world as our personal oyster when we cook; we draw inspiration from all over, from the Middle East to Southeast Asia, Spain to Japan. The one commonality is lots of flavor. Lots. We're all about bright, colorful, lively food — food that's both moreish (a wonderful Britishism referring to something you want to eat more of) and healthy-ish (that one's self-explanatory). Acidity and spice are essential to healthy-ish cooking, and chermoula is a favorite from our arsenal. This spicy green magic is marvelous on many things — grains, meaty white fish, grilled shrimp — and is especially tasty on sweeter vegetables like carrots, beets, and winter squash. We're currently addicted to the combination of roasted carrots, chermoula, and toasted hazelnuts, layered on a platter and finished with a generous sprinkle of lemon juice and zest. It's vibrant on the plate and in your mouth, and it's as healthful as it is delicious. Serve it as a side dish on a holiday table, or nestle the carrots in a bed of lemony, olive oil-slicked wheatberries or farro for a vegan main event. 1. Preheat oven to 425°F, line a baking sheet with parchment paper and add the carrots. 2. In a small bowl, mix the coriander, cumin, and olive oil. Pour the mixture over the carrots and toss well with your hands, making sure the carrots are well-coated. (Even oil distribution is the secret to uniformly caramelized vegetables! Use those hands. That’s why soap was invented!) Sprinkle liberally with salt. 3. Roast the carrots until they’re browned and you can pierce them with a fork, about 35 minutes. 4. While carrots rest, make chermoula by tossing everything in a blender and blending on high until the mixture is silky. Thin a bit with olive oil or water if needed (it should be thicker than a vinaigrette yet easy to drizzle). 5. 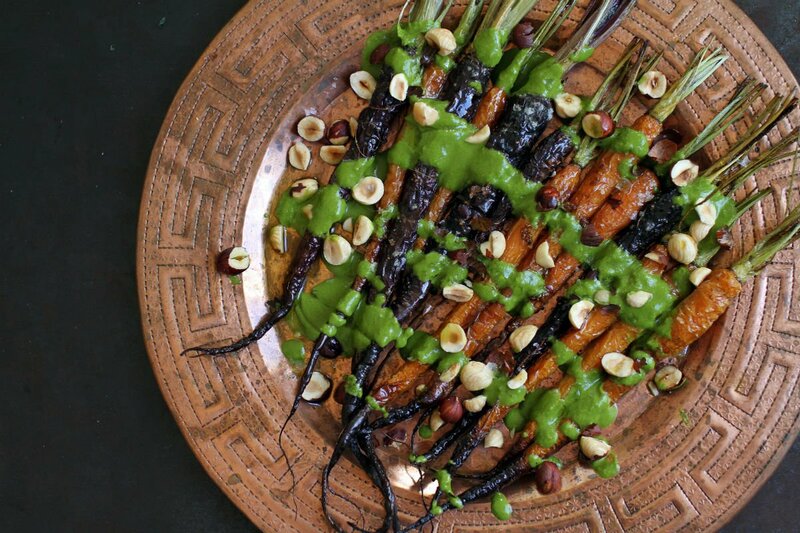 Arrange the carrots on a shallow serving tray, sprinkle with hazelnuts, and spoon chermoula generously over the top. Season with the lemon juice, zest, sea salt, and pepper. Note: The sauce will keep in refrigerator for about five days, but will brown a bit as time goes on. Get more inspiration and real-deal, good-for-you recipes from . Learn more about the mission behind Botanica restaurant, market, and magazine. (the pledge gifts look delicious). Emily and Heather are the founders of , a restaurant and market (opening in LA in 2017) and publication. Their goal on the plate is simple: to create food that is colorful, fresh, fulfilling, and healthful — food that makes you feel good. Emily travels for the detours. Heather travels for the life-changing feasts.